Ultra Palmolive Pure And Clear Is Hypoallergenic And Clear As Can Be With No Heavy Fragrances And No Irritating Dyes. Tough On Grease And Gentle On Your Senses, The Phosphate-Free Formula Leaves Dishes Sparkling Clean Without Harmful Residue. 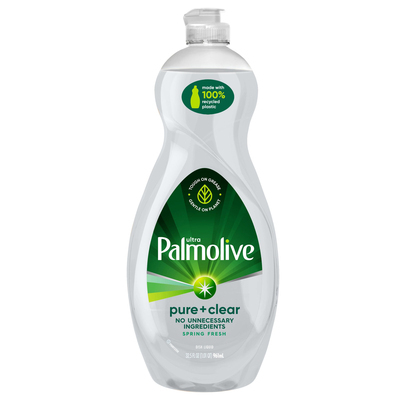 Dish Cleaner Is Effective In Cutting Grease And Removing Stuck-On Food..
Ultra Palmolive Pure And Clear Is Hypoallergenic And Clear As Can Be With No Heavy Fragrances And No Irritating Dyes. Tough On Grease And Gentle On Your Senses, The Phosphate-Free Formula Leaves Dishes Sparkling Clean Without Harmful Residue. Dish Cleaner Is Effective In Cutting Grease And Removing Stuck-On Food.